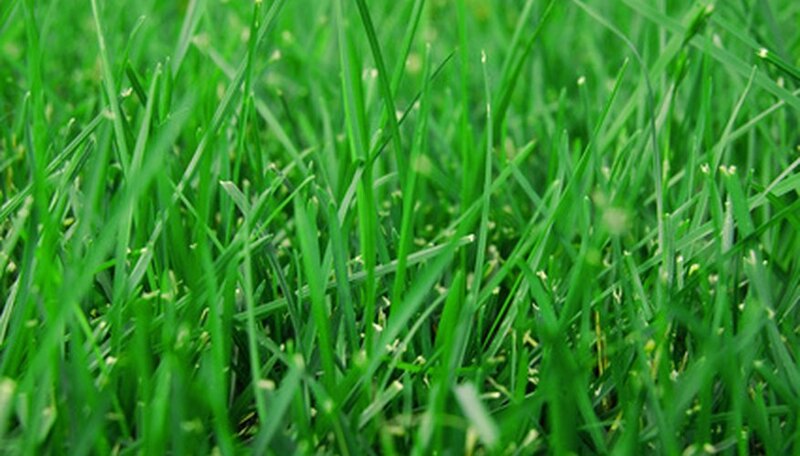 Gardeners encounter two types of ryegrass--perennial ryegrass and annual ryegrass, a common turf grass in cold seasons. These grasses have different uses and look different, allowing gardeners to tell them apart. Identifying ryegrass can help gardeners and farmers select pasture grass or hay grass or provide turf grass with the right planting environment and level of care. Perennial ryegrass (Lolium perenne) gets used as food for sheep and cows and is a high-quality forage grass, notes the University of Wisconsin. Annual ryegrass (Lolium multiflorum), or Italian ryegrass, gets used as a cover crop and winter forage grass, and also in backyards. Both types of ryegrass are native to Europe. Ninety percent of the annual ryegrass in the United States grows in the South. Perennial ryegrass grows along the East and West Coasts of the United States. Annual ryegrass turns a yellow or golden color when it dries, while perennial ryegrass turns a khaki hue. Both grasses are shiny and dark green when alive. The best way to tell the difference between perennial and annual ryegrass is through the width of their leaf blades. Perennial ryegrass has a narrow leaf blade of 2 mm, while annual ryegrass measures 5 to 6 mm wide. A ryegrass with a wider leaf blade of 10 mm, poison ryegrass, exists, but this is not planted for pasture. Annual ryegrass gets planted in the fall and dies in the spring, turning yellow when it does. It is frequently used as a groundcover in the Southern states, so there is something on the lawn when the warm season grass dies out. The shiny green blades have vertical ridges. Developing leaf blades are rolled in their buds and flatten out later, whereas perennial ryegrass has flat-developing leaf blades.